Are you ever completely alone? I get a lot of time alone - simply because I have two kids in school (other than during the summer months), and I also work from home. Thus I haven't any children or co-workers hanging around the home/office during the day. With home phones (the dinosaurs that they are becoming), cell phones, texting, email, FB, and Twitter, I can always be reached. And because of my personality, I like to answer quickly. So while I may be alone. Truly, I am not. And that is what God would like to add to my spiritual fitness: the practice of Solitude. I need some training in the area of being alone while being alone. After all, Jesus withdrew. Often. Check out Matthew 4:1-2, Mark 1:35-39, Mark 1:45, Matthew 14:13, Matthew 14:23, Luke 6:12-16, and Matthew 26:36ff. Along with being quiet, (which, by the way, was just brilliant yesterday - God spoke and I wrote for close to 30 minutes without pause), I also need to approach this discipline solo. 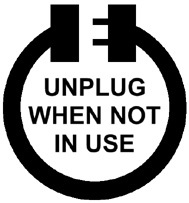 Which, in my world, also refers to going unplugged. So please don't be offended if I don't answer you straight away.